Saturday was a day that we just wanted to drink coffee and tea, grab a quick bite and do some people watching. For those of us that aren’t fortunate enough to live in Portland, this is a Saturday morning treat. We made our way into Lovejoy Bakers and we were greeted with quite a line. Not to worry, they keep things moving pretty fast. 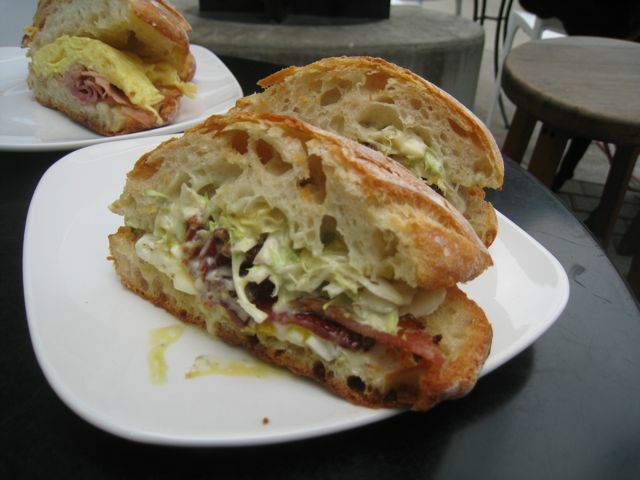 I ordered the ever popular Lovejoy Delux, which had a fried egg, blue cheese dressing, thick cut bacon and frisee. It was super tasty, but you do need to like blue cheese to enjoy this sandwich. And I did just that! My husband got the ham and egg sandwich and I have to say he did get what looked like more eggs than I did. I think going back I would choose his over mine. Atmosphere is a bustling coffee shop bakery with quite a bit of seating. 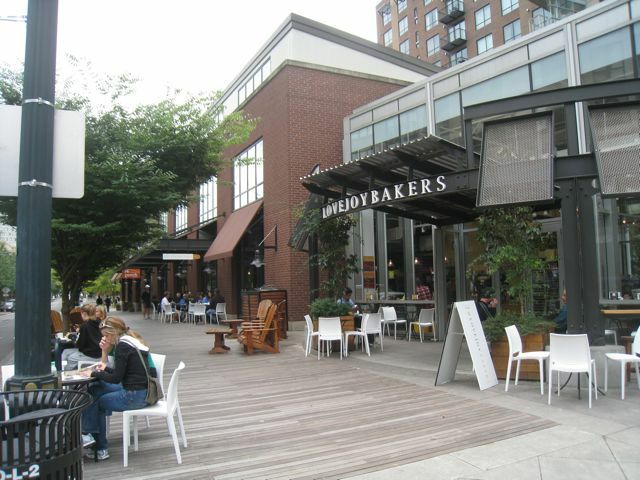 The adorandak chairs outside are pretty cool and they are great for just sitting and enjoying that cup of joe. People were coming in with their kids and others had their furry friends. Tea is Smith. Not sure if this is new or not, but I am starting to see it pop up everywhere and I like it a lot. Coffee is Stumptown and you can get free refills. My husband was pretty stoked about that. They do have a few local beers and I read that they have wine as well. Pricing is good for a place like this. Each sandwich was right around $6 and they were good sized. It’s located in the Pearl. I’ve eaten at Lovejoy Bakers several times in the last month. It’s one of my new favorite finds. All the sandwiches I’ve had have have been really good (the banh mi, the roast turkey with cranberry chutney, the smoked salmon on ciabatta). I had a great cup of curried butternut squash soup there, too. YUM! I actually went down there on your recommendation. And I thank you for that. It was indeed a great find and we will be back. I can’t wait to try some of the lunch sandwiches and the soup. I do love butternut squash!